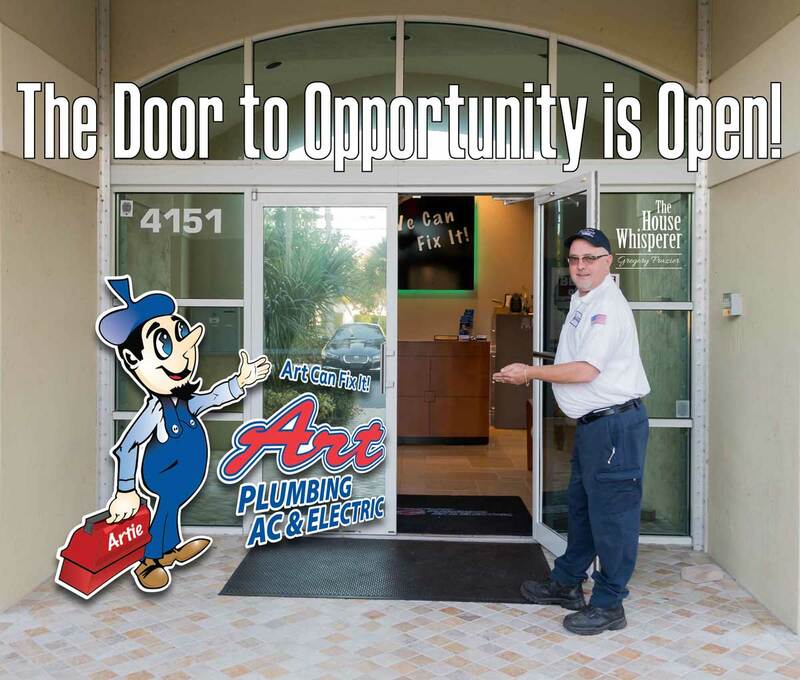 Home » Plumbing, AC & Electric Tips » The House Whisperer » The Door to Opportunity is Open! I am just back from a continuing education class and as I was looking around the room I noticed something that is becoming a disturbing trend. There were no young people in the room. If I was guessing the youngest person in this room of around one hundred persons was in their late forties. Our society has changed so much over the last thirty years or so and my bold statement for the day is “The Trades are dying”. First, who are The Trades? Very simply they are the men and women that keep the water flowing, the electricity on, the roads paved, the buildings built, the packages delivered and just in general The Trades allow society to function in a civilized manner. How much chaos do you think there would be if suddenly you had no water or electricity? I can tell you from personal experience after a hurricane just not having the two most basic things (water & power) for a few days is a living hell. Now imagine a major infrastructure collapse where the electricity is going to be off for months. Scared yet? Okay, how about you need a new kitchen faucet installed in your home and they tell you the price is $5,000, or worse you need a new air conditioner installed and the price tag is $30,000; that sounds outrageous right? I can tell you being an insider to The Trades the aforementioned scenarios are not that far from coming true because The Trades are dying. I am not sure when this happened but in today’s society the big push is every kid in America needs to go to college. It seems most schools don’t have vocational programs anymore and working with your hands is something to be looked down upon. I was doing a little internet digging and the typical college graduate leaves a four year program close to $40,000 in debt, then if they are lucky they get an entry level position somewhere making $35,000 a year. According to an article I read in Forbes the student loan debt in the United States for 2018 was over 1.52 trillion (Yes, I said trillion with a T) dollars and one out of 10 people with loans were in a default status. Ok let’s turn the coin over. I can send a high school grad to air conditioning school for around $4,000 for a year. That person spends the next three years truly learning the trade while making money. That is the same four-year investment of time so far, right? If my air conditioning school grad is any good at what he does he is now making way north of $40,000 a year and is likely debt free. In another couple years his income continues to increase with experience, the jobs get better and better and I can tell you I know guys in the AC industry that make well over $150k a year. Not too shabby if you ask me. This also holds true for electricians, plumbers, welders and many of the other trades although the time in school may vary a little. Here at the Company we see it every day. People are retiring and finding replacements is becoming increasingly more difficult. We would literally hire 25 people right now if the right ones came through the door and we are just one of thousands and thousands of service companies across the United States in this position. According to Mike Rowe’s foundation. Mike Rowe Works, there are approximately 6 million “shovel- ready” jobs in our country today, meaning those are open positions in The Trades that need to be filled! So, I beg of you, if you are a young person or are mentoring a young person take a look at The Trades as an option for your life’s path. Yes, you will work hard, however you will reap the rewards of your hard work, get to help people solve problems and if you are any good you’ll never be unemployed a day in your life. Okay rant over, no jokes or puns today. I am just asking for your help to not let The Trades die. Until we meet again be safe my friends.